This version is not Windows XP compatible. If Upgrading to a Computer that already has BarrelTime, use the backup utility to copy your files to a flash drive. Then Install v6.0ß Due to Windows 8/10 UAC requirements, the New version may install to completely different folders. What's in this Version? : This BarrelTime version contains the core of what will be in the full v6.0 release. But there have been too many useful and exciting changes to "hold back" until v6.0 is completely ready to go! 1) the Help files need to be brought up to date. 2) this web site needs a major facelift & update. 3) a new installer needs to be built. "Do you want to allow the following program fron an unknown publisher to make changes to your computer?" start up. that will be launched with the v6.0 Full Release. So while the finishing touches of v6.0 are being wrapped up, we are introducing this v6.0ß pre-Release version -- at a special price! When the completed v6.0 IS released, your upgrade to the new version will be free of charge. See How it Works in a typical Race! Download a Fully Functional Demo Copy and Give it a Run Around the Barrels! Note: BarrelTime Downloads are Demo Copies. An activation key is required beyond the Demo time limit. BarrelTime Current Version is Version 6.0ßa4 Release Date: 11/24/2018. The Help Files (included in the BarrelTime download) are undergoing substantial revision. Last Help Files update: 10/16/2018. Note: You DO NOT Need to be connected to the Internet to use BarrelTime or the BarrelTime Help Files. If you are running ANY Previous version of BarrelTime in Win8, Win7, WinVista -- Upgrade NOW! If you are running ANY Previous version of BarrelTime or Barrel Racer in WinXP, WinME, Win98, Win95 -- or even DOS -- Upgrade NOW! Click on "Download BarrelTime " to download the Installation file "BarrelTime_Installer.EXE." When prompted, Click on [Save] or [Save File] to save the installer to your computer - then Run the Installer from your Downloads Folder. 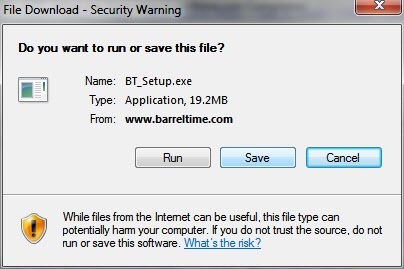 Note: The name of the file will be changed to "BarrelTime_Installer.EXE" for the following screen shots. Your Virus Protection Software may give you additional prompts or warnings. Go to " Downloads" (or the folder you chosen for downloads) to find "BarrelTime_Installer.EXE." Microsoft® doesn't want you to Download ANYTHING they are not being paid for; anything else is treated as a Virus! Click on [Run anyway]. "BarrelTime_Installer.EXE" is the BarrelTime Installer. Keep your copy of the BarrelTime up-to-date. Check this site from time to time for updates to keep your copy current. New Networking options and capabilities. or any version of * we STRONGLY suggest that you download the current version. Windows XP Users: Windows XP and below are no longer supported. Open BarrelTime. From the Main Menu select | Utilities | Back Up Data Files | - then follow the Backup prompts. v6.0 will install to completely different folders from previous versions. You will be able to run both versions/installations independently. During the Re-Instllation you will see the installer re-indexing your files. You will also be propmted by the installer to re-start BarrelTime from the desktop. When the re-installation has finished, open BarrelTime from the new desktop icon. The updated version number on the main menu page will confirm the successful installation. Call for Special v6.0ß Pre-Release Pricing! Professional Version 1st Year Subscription¹ - Normally $299.95 - Call! Director's Version 1st Year Subscription¹ - Normally $199.95 - Call! ¹The Annual Subscription Fees may be implimented with Version 6.0 (full version). ¹ No Subscription Fees will be charged to users who have purchased earlier versions. ¹ BarrelTime's Annual Subscription Fees assure continued upgrades and support for the system.